Line bred in Germany, this fish closely resembles the Ruby Red. Males have a little more blue in their face than Ruby Reds and may or may not show a more reddish orange rather than orange body Ruby Reds. This is not a redfish despite the name. They are really a bright orange fish. They are not the rare red strain that may have been available in the hobby years ago. Even so, these fish are quite attractive. Females are cream with brown stripes. 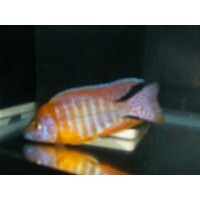 These fish are line bred from the Aulonocara Stuartgranti Chipoka group of peacocks. 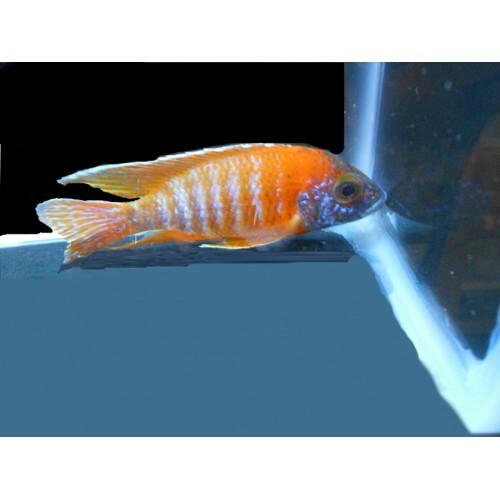 Some part color males may be more yellow-orange than an orange but will turn orange over time. Last, grow out count 03/15/2019. Next, grow out count due 04/05/2019. Grow out counts are counts of the fish in stock checking for additional males and increases in size. These fish are grown out from in-house stock. Best kept in single males in all male tanks. Sometimes a single male may be intimidated by other tank mates. In that case, this fish may work in groups of three or more males, though some secondary males may not achieve full color. 55-Gallon or larger tank recommended. 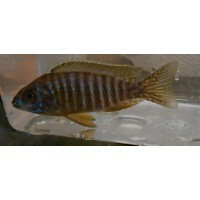 Recommended Foods: Recommended Food: Xtreme Cichlid PeeWee This food will help to maintain color.